I read a post about the power of comments recently. The basic idea is this: one of the best ways to build your online network, is by leaving comments that add value on other people’s posts. 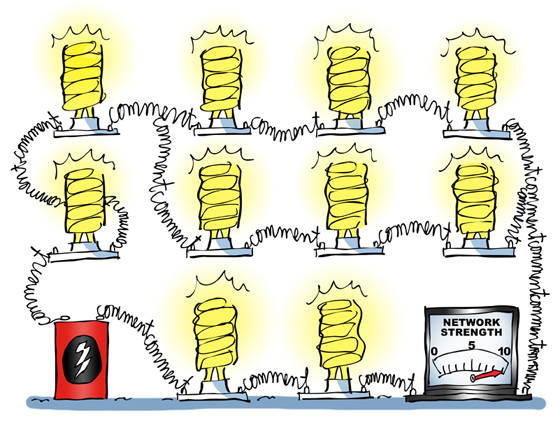 The idea of comments leading to connections conjured up this illustration. Am I somebody that does his own electrical wiring? No. I can change a lightbulb– that’s about it. Here’s a detail image. What do I mean by leaving a comment that “adds value”? Comments like “Nice post!” and “Really enjoyed it!” don’t add anything to a post, content-wise. I’m not saying they don’t have value– they do. They’re kind, they’re supportive, they’re appreciated– but they’re not likely to engage the author or other readers. A comment that contributes to the discussion, however, adds value. When you leave such a comment, you’re providing additional content. You’re sharing your own expertise or experience, and making the post stronger and more comprehensive. Such comments get special attention– from the author and from other readers. By leaving an “added-value” comment, you’re drawing attention to yourself as someone worth knowing. The author may reach out to you, so may other readers, asking to connect. Perhaps you’ll be the one to reach out. But don’t rush things. Leaving a comment is like planting a seed of goodwill. Give it time to germinate. 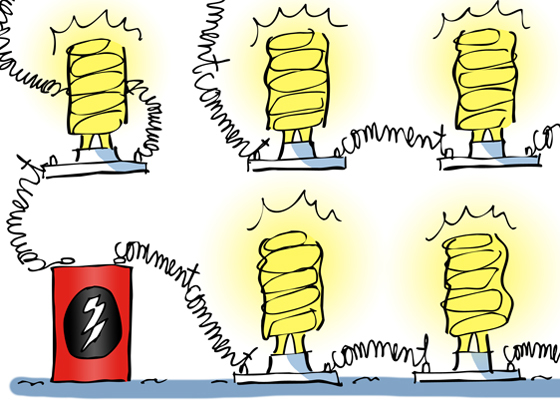 Here are 15 tips on leaving comments, as a strategy for expanding your online network. 1. Make it a point to comment on a few posts every day. 2. Choose posts that attract the kind of people you’d like to connect with. 3. Comment with a view towards building a relationship. 4. Be polite, stay positive. Always. Avoid direct criticism in favor of positive suggestions. 5. Comment on something specific in the post, and/or add a new thought. 6. Draw on your own experience and expertise when you comment. 7. Consider responding to other readers’ comments, and attracting their attention. 8. Never force a comment. If a post has no real value, don’t waste your time. 9. If you’re the post author, always respond to any comment left on your post. 10. If someone responds to your comment, do not immediately ask to connect. It reeks of insincerity and opportunism. 11. Never engage negative or abusive people. 12. Be patient, be persistent. Give comments time to work and establish trust. 13. Accept the fact that a comment may fall unheeded into the void. That’s life. 14. Say no to profanity. Some will defend it as hip. Don’t buy it. Attitude is a poor substitute for professionalism. 15. Your comments are a part of your brand. Every word. Never forget that truth. Here’s a close-up detail. 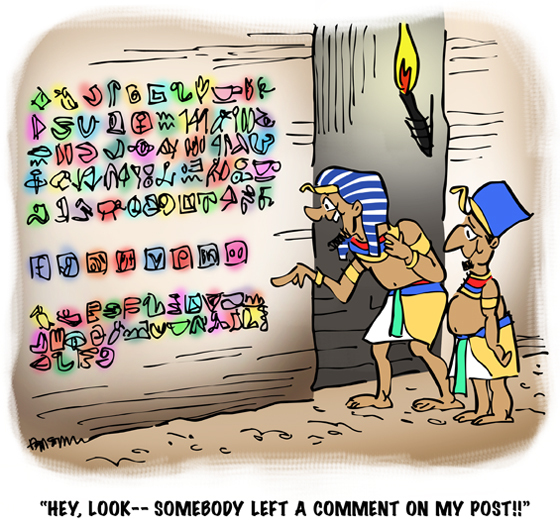 My favorite part of the cartoon is the little social media icons (Google+, Vimeo, Pinterest, LinkedIn, etc). Yup, just press the wall to share the post with your friends! Are you someone who leaves comments? Ever left one and wound up making a friend? Do you have a strategy for making connections and building your online network? Care to share it? Ever noticed any blog posts on tomb walls when you’re watching one of those mummy horror movies?? I actually really appreciate this post. Being newly returned to the blogsphere I often find myself at a lost on how to navigate and connect with people online. This was very helpful. Am I the first to arrive? Wooohooo!!! 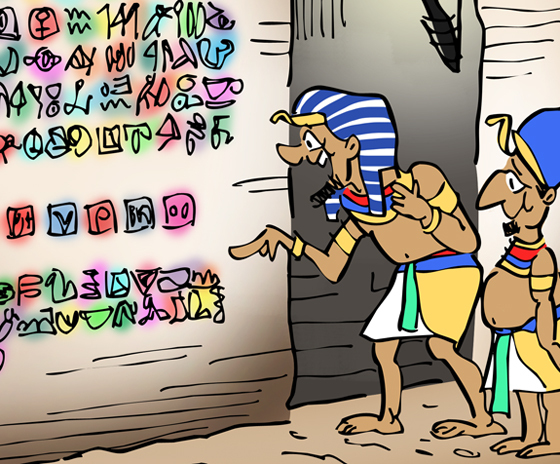 Gotta say something RIGHT NOW and then I’ll be back in a few minutes: I lovelovelove your hieroglyphics blog illustration! BWAHAHAH!! It rocks! OK – I’ll be back in a flash! Translation: You’re The Best, you make me cry happy tears, yer a breath of moonshine here in the netherworld, and your camel wants a burger and a beer!! Mark! Super-beefy post! I read the LinkedIn one first and was thrilled to see your illustration there. Bravo! It’s all such good advice (yours and the LinkedIn one), based on insightful observations about how people really do things/feel things. One-click “liking” and sharing has left many people with the impression that they’re connecting and being connected with, but that’s not the case at all. True interaction matters…too bad that it’s not the norm. 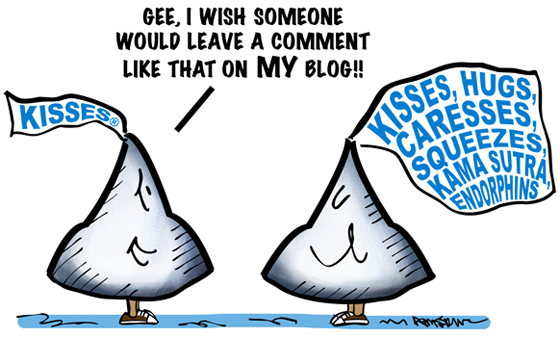 If I could have one web-wish come true it would be to eliminate “Likes” unless they were accompanied by comments. I’m weary of people who do social drive-by’s, spraying their “Likes” all over the place but never stopping to say anything. My suspicion is that they just want to be noticed. But it’s a negative notice, as far as I’m concerned. I’d rather have a less attention if it’s meaningful than hordes of “Likers” blow mindlessly through my blog. LOL!!! I pretty much mangled both of those violent metaphors up there, time to exit. Thank you for that lovely and off-the-scale supportive comment, dear Robin! Yes, Karthik Rajan wrote a great post— definitely got me thinking. I guess there are a couple of take-aways here, pardon that hip buzzword: 1) if you want to get noticed and make a positive impression on social media platforms, you have to make a contribution: ideally, one that highlights your expertise and/or hard-won experience. 2) is a more painful truth: comments are hard work: they require thought, reflection, effort, editing, good grammar, and… time. I guess I have mixed feelings about “Likes.” True, they’re easy and don’t require a lot of thought, which makes them somewhat superficial. On the other hand, many readers are pressed for time, and just want to say thanks, good job, I enjoyed it. It’s a nice gesture, and, I think, well-intentioned. And Likes can lead to engagement, since WordPress.com always sends an email notification (when someone Likes your post), suggesting you might want to visit their blog. I usually try to return the favor, and have had some good experiences. FWIW. Quick reply, will be back later (LOL — you must be sick of hearing that!!) just wanted to say “Yes!” I agree about the “Likes.” I didn’t take the time to say it above (should’ve!) but some people do read and like, then “Like” but can’t hang around longer than that. It happens to everyone at some point. And when I get a “Like” I do visit the “Liker’s” site. I read, comment, etc. If I enjoy it I go back a couple of times, at least. But if the person never replies, never says anything on my site, and — the worst part, IMO — delivers a “Like” to me within seconds of my posting (no time to read!! ), then I exit gracefully. If I really like their posts I do try again. But even my time is valuable, so I don’t try more than a couple of times. Over the years I’ve found that a large portion of the serial “Likers” are never going to do more than that. Some of them post in languages I can’t read, trying to sell merchandise that makes me blush. Others “Like” me until I “Follow” and then they never “Like” me again, much less visit and comment. They’re “Follow”-farmers and they’re easy to spot. The reciprocation thing makes a difference and I do it. I think it’s not only kind and polite but also useful. I’ve been told by a few people that it’s stupid, pointless, etc., but I don’t think so. If someone reaches out to me, I reach back. Well, unless they’re reaching out with an axe or something. Then I run like the wind…Ha!! Gotta go – I have a rain check from Target for two 40oz bags of Reeses that were on sale last week. Can’t delay! “Follow farmers”– a new agricultural term, with ominous social media overtones!! And yes, when someone reaches out to you with an axe, it’s time to exit, stage right, as ol’ Snagglepuss would say. It’s good advice– and you know that if you’ve ever watched Hush, Hush, Sweet Charlotte— chop! 40 oz. Reeses on sale?? Huzzah! Hope ya got there in time– Happy Dining!! Great Post! Your information is excellent, and your graphics always crack me up! I love the social media icons. Yes, I leave comments, and I really try to say something more than the first two words of this comment! Your Like button strategy sounds excellent. Yes, a calling card: I was here, I read it, I liked it, I having nothing to add right now. A supportive hat-tip… sometimes that’s the best we can do. It’s hard to write a comment when you’re not in the zone. => Tip #16: Know when it’s time to pack it in, and head for the exit! Thanks a heap for stopping by my blog too… can’t remember seeing you for a few months, though, so hopefully you are getting tons of good paying commissions! 🙂 thanks for your reply, Mr. Caveman. All I recall from the good, old wood fire days over here in Europe are the ice crystals on the carpet in the mornings, before said cosy fire was built. I am quite content with central heating. But have to admit, that I sometimes miss the nice sounds, real fire makes. Not missed are the ashes, the dirt and the hard work of gathering, sawing, chopping and stacking of fire fodder…. Yay!! Got my Reeses! ::whew:: Big relief. And thank you for all the kind things you said! Oh, wait– you wrote that comment a few hours ago. The social media icons on the pyramid wall is genius. I really enjoyed that detail. I feel about comments – the ones I write that is – the same way I do about conversation so I try to follow rules of etiquette and have good manners. The teacher in me also leads me to strive to leave comments that are encouraging and provide positive feedback. Sometimes I’m rushed so I might just leave a brief comment or click “like” but for me a lot of the pleasure of blogging comes down to interaction with other bloggers and readers and comments are obviously critical to that. I think of “likes” or brief comments as being a sort of supportive pat on the back or smile but comments are definitely appreciated more because they are a conversation. Hi, Laura! Your comments have a wonderful serenity about them. They actually create a receptive atmosphere in which to work– that’s a rare gift. We seem to be completely in sync: etiquette, good manners, being positive and supportive, providing useful feedback– sounds a bit like something from a Scout handbook, I suppose, but those are all values that never go out of date. Subscribing to those values and living by them lifts everyone up and makes the world a better place. A comment is a lot like any kind word, really, and has the same kind of power. I think you might have a cartoon in scouting Sinatra. Reblogged this on Po Po Land. Mark, you are a master at leaving comments, and yours are always the best. I could take your comments from my blog posts and turn them into a book destined to become a best seller! These are great illustrations (as always) and a great list. I’m happy to say, I accomplished #9 this morning. A couple of them were two months late, but I did manage to reply. Thank you for that very toothy comment, and for your jolly support, sir!! Blush, colorete, rubor doble y triple rubor!! ¿¿Es mi cara roja o qué?? ¡Lo siento! Pero estoy muy feliz de-tener ese misterio resuelto, y realmente aprecio su ser blanco tan buen humor al respecto. Y gracias por la hug– lo necesitaba!! Mark jjajjajaja is neither Marta nor Martin. “Martes” is “Tuesday”. Why? Because that day my weekly public story. The fault is all mine because I did not tell if it was male or female. I apologize for being so rude. And forgive my google English. Mark! You made me laugh a lot. At last you have seen clear my name. No matter destrocemos English or Spanish, the most important thing is that you and I can talk, even if others laugh at us. Maybe we learn! A big hug from Barcelona! Rain also irrigates my city today, it will be that inspires us. I love the way you do close up of your sketches. As an artist myself seeing the picture close up makes me think about your technique and how I might better my own + it also makes me want to come back to your posts and say nice things like kiss, mwah, hugs for you! Thanks for sharing (and the close ups)! Thank you, Fiona! You summed up the value of detail images very nicely. I feel the same way. I’ll often come across an illustration and wish I could see a certain part up close. It’s always so helpful to be able to study an artist’s technique, and think about how they achieved a certain effect. Thanks again for your lovely comment, I’m delighted to meet you! Thanks for your kind words about my art and humor. There’s something very mysterious about humor. Some people do seem more disposed toward it than others, but even that seems mysterious. I love jokes, puns, and banter (verbal), but there’s something about visual humor that seems to have a special kind of power. Am I perhaps a little biased there?? Yes– definitely! I could feel a void lately but wasn’t quite sure why… now I know! I haven’t been around here for sometime and everything is gloomy! No more though! I am gradually taking my Mark doses of joy and the sky is clearing! Of course you are very right and to the point – as always. [how could it be otherwise my genius friend!]. Thank you for your kind words, but remember: words are unnecessary, your presence is enough. Hello, I’ve only just begun blogging recently, I never thought I’d ever have a blog but its crazy how life works out sometimes. Anyways, I really enjoyed this piece, its been very helpful. The theme of my blog, people’s role in the making of their cities, I feel, is going to require a lot of interaction from readers. Or at least that’s what I envision. I’m hoping that eventually people will not only read it but also use it as a tool to intervene in their own cities. So I’m looking for all kinds of advice on how to get people involved, sharing their knowledge, particularly about their cities so I can get ideas on where to go next and what new project to check out and write about. Looking forward to reading more from you! Best! What a lovely comment!– thank you very much. Your new blog sounds wonderful: a resource for people who want to help chart a brighter future for their cities. And yes, people’s comments would be a source of ideas, new topics to write about. Interesting!– I had never considered that: encouraging comments not just as a way to meet people and attract other readers, but as an ongoing inspiration for new post topics. Excellent!– you have clearly advanced the discussion here! I comment on blogs of regular readers for my blog and will comment on a new blog several times per week, that I’ve never read before if I have something worthwhile to say. That pretty well describes my strategy. I agree about not engaging in an abusive, negative commenter. I do “like” blog posts sparingly. Hi, Jean! Always nice to see my favorite Far North Cyclist pedal in. I like your strategy: support your regular readers (the ones who consistently support you) by commenting on their posts, and lend support to new blogs by contributing to relevant discussions. I think we’re much more likely to return to a blog if the author has replied to our comment. The more engaging the reply, the more likely we are to return. Mark, I agree! An “added-value” comment which adds new insight to a discussion is much more interesting to readers/authors. Thus making the comment (and comment author) a little more memorable! I love the parallel you drew: some comments are like acquaintances: pleasant, encouraging, light; other comments are like friends: something deeper gets shared, which leads to a stronger bond. By taking the time to leave a comment that adds value, we open the door to a deeper connection: a new friend, a new business associate, new possibilities. Always wonderful to see you, thanks as ever for all your kindness and support! How is it whenever I tune into your blog there is always something of value that applies to my life at this moment. I would like to share this, Mark, if that’s okay let me know. I loved this post Mark! Sorry I’m late to the party. This is an excellent list. I agree with #3 – comments should be all about building a relationship. Most importantly, it should show you read the post. That’s why I rarely stay subscribed if I don’t find a blogger’s posts at least somewhat compelling. We should only read what we find interesting and not feign interest just to make some sort of connection. All of us take a lot of time and effort to write each post. And it may not look like much to an outsider, but to the person who wrote it, it’s probably very significant. So we have an obligation to spend time reading it, and offer our opinion. I agree 100 PERCENT about civility. Act like an adult. Never curse or insult. Being a good “host” means putting your foot down about how people behave in “your house”, and I don’t allow incivility on my blog. Having said that – I’d prefer someone challenge my posts, form a disagreement, than have them fake interest or make some comment just for the sake of joining the discussion. I post about science and films – and without debates, my blog gets awfully boring! Feigning interest– ha! Yes, it’s problematic. Funny: it’s something we all do on a regular basis: making small talk with people at parties, listening to a friend go on and on about what they did on vacation, etc. Dishonest, I suppose, but it runs up against the need to be polite and give others a chance to shine. I agree, tho: feigning interest is a losing strategy if you want to build a good relationship. Waste of energy, waste of time, plus you’re sure to be exposed in the end– pretense is very hard to sustain!! I also agree about responding to all commenters. It’s the courteous thing to do. We’ve all been snubbed at some point. It’s no fun. And snubbing others always says something unpleasant about ourselves: we don’t consider some people “worthy.” It’s bad for our brand, it’s bad for our reputation, and it’s bad for us, period. Great to have another vote for civility, and you’re right: we need disagreement. We never learn anything from people who agree with us, but we can learn from those who disagree– if we’re prepared to listen. A Rockhopper left me a comment?? That’s a first– and an excellent one! I’m delighted, thank you! I’m not sure what to say about the comment-spam problem. Every so often I’ll hear of someone who’s had that experience (not necessarily here on my blog). They’ll leave a comment somewhere, and the WordPress spam filter (known as “Akismet”) will classify it as Spam. I’ve rescued a few comments from Spam, but it’s rare, and I can’t remember the last time it happened. I’m sorry if you’ve had this experience. I’m afraid the only thing I can think to suggest is contacting WordPress Support, and giving them the details of a particular case. Sorry I can’t be more help. I recall leaving a comment or two to this creative, humorous fellow several years ago. What was his name? Oh, yes – Mark … Mark Armstrong. And that wonderfully funny guy made a comment on my blog, too. His remarks were always engaging and fun. Great post. I am new to the blogging world, so it was informing. Thanks. And I learned a new word today Blogosphere. I hereby submit my CV* for your perusal – I hope it meets your high standard of blogging. Anyone lucky enough to keep company of “Dam Good Work” will find its content is always germane to good cheer. How on third planet did you manage to work that out?? It’s a true work of art!! I copied it, boosted the font size to 80 points, and sent it to myself in an email, so I can gaze at it whenever I want and experience instant nirvana!! Thank you for an incredible gift!! I showed it to some of the other Varanasi Wise Men down at the Ganges Club, and they immediately went into a deep trance. Very sound advice. I especially like “15. Your comments are a part of your brand. Every word. Never forget that truth.” I keep that in mind whenever I leave a comment on a blog or post on social media. Thank you very much, Pierre. I’m often astounded at some of the things people put in their comments. Words are hard to take back (especially when they’re in writing!) A good reputation is a precious commodity, one that’s easily squandered by a careless word or lapse of taste. You’ve elected to keep to the high road, and that says great things about you. Nice to meet you, and thanks again for your kind comment!